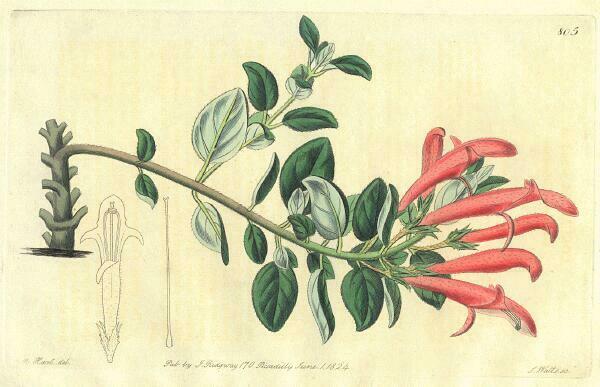 Columnea has long fascinated both botanists and growers because of its diversity and beauty, and was the subject of many early illustrations in botanical publications of the 19th Century. This is C. scandens, from Edwards’ Botanical Register, 1824. The evolution of Columnea still remains a mystery in many aspects, especially regarding the function of some of its morphological traits as well as a solid explanation for the larger number of species in this genus when compared to other New World Gesneriaceae. We are beginning to get an idea of the origin and relationships in this fascinating genus and hopefully we will see more conclusions in the future. What we are fairly confident of is that Columnea is a monophyletic group, meaning that all of the species in this genus have descended from a common ancestor that is shared only by the species in the genus. This conclusion is based on many different species in molecular phylogenetic analyses, as well as the indehiscent fruits found in nearly all species. The one species of Columnea that clearly has a dehiscent fruit is sister to the remainder of all other species in phylogenetic analyses that have been conducted to date. This implies that there is a transition from indehiscent to dehiscent fruits within the evolution of this genus. A recent study investigating the correlation of climate and character states across a phylogeny of the species in section Angustiflorae concluded that many factors are responsible for speciation and morphological divergence, likely including dispersal to islands, shifts in pollinators and changes in leaf size and shape in response to different climatic factors.